You have suffered a change that alters the very system that you live by. No wonder you feel like you world is in chaos. You can’t cope or figure life out anymore. You don’t believe that anybody can help you, or even understands you…it is foolish to imagine you would not be changed by grief…You’re not going to bounce back to who you were. Because of your encounter with loss, you are going to bounce forward to become someone you are not yet acquainted with. When something aches, we call it tender. The question is: Can we allow our own tenderness, the places of our wounds, to eventually serve ourselves and others so that we cultivate tenderness, the soft, elastic quality of kindness and love? Sherri Mandell knows well the chaos of grief. When her 13 year old son Koby and his friend Ish-Ran cut school and went hiking in Haritun Canyon near their home in the Judean hills, the two boys were kidnapped and murdered by a group of Palestinian terrorists. The boys were trapped in a cave and bludgeoned to death with rocks. From this tragedy of unimaginable magnitude the Koby Mandell Foundation was birthed – a ministry created by Sherri and her husband, Rabbi Seth. This foundation conducts therapeutic healing programs, overnight camps, and retreats for terror victims – bereaved mothers, fathers, widows, orphans, and siblings. The Road To Resilience, is based on Sherri’s first hand experience with returning to life after the senseless murder of her son – of being rebuilt, after being shattered. Vulnerable and authentic, Sherri shares words of kindness and love – of tikkun olam (bringing healing and repair to the world) from the tenderness of her wounds. The Jewish concept of resilience does not mean being impermeable. Nor does it mean to bounce back…Jewish philosophy teaches us that resilience is not overcoming. It’s becoming. Becoming more, becoming our fullest and deepest selves as a result of adversity…We don’t leap over troubles as if they don’t exist. We allow them to be our teachers. We experience resilience when we are enlarged rather than diminished by our challenges, when facing adversity causes us to change, grow, and become greater. Moreover, resilience offer us the opportunity to deepen our relationship with the Divine. 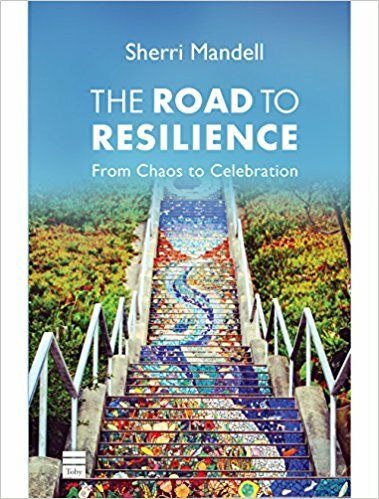 The Road To Resilience is a short read, less than 100 pages, but every line is packed with truth and wisdom. Sherri walks the reader through what she calls the seven C’s – the seven spiritual stages of resilience. Each stage is accorded a chapter. Under each of the seven stages I am including a tiny, minuscule glimpse of it’s beauty. In truth I could open this breathtaking book to any of it’s pages and share words of tremendous kindness, hope, beauty, wisdom…healing. Grief is like an invisible bag of cement that everyone is carrying on their shoulders. And understandably, most of us would like to flee from the chaos that accompanies trauma and bereavement. Every seed has to disintegrate before it can turn into a vegetable. Every seed has to break apart to sprout; it has to surrender to the darkness of mystery in order to emerge. That process can feel excruciating. But it is only when the seed turns to nothing that it can, in fact, become something. In Jewish thought, creating resilience rests not only on the individual but on the community…No matter how strong our faith, when suffering strikes, we need others to help us unlock the prison of our suffering. On the first night after Koby was killed, when I went upstairs to my room, resting on my pillow was a little bunch of wildflowers from a friend with a card. Just when I thought I would die, I smiled. Because my friend had entered my room to give me love. Choice can protect us psychologically, especially in times of trauma – even when it cannot save us. …Faith is achieved when one believes that G-d is compassionate and loving even when it seems the opposite – despite what our eyes witness in this world, that so often terrible things happen to innocent people who deserve better. Sherri shares about choosing to turn a good eye, a loving eye, toward yourself and others. When we feel that part of us is missing, that the world has lost its wholeness, that we suffer from a dissonance that cannot be reconciled, creating can help restore a sense of integrity. When we create, we enter our disturbance in order to search for meaning, harmony, and wholeness. We struggle to discern order hidden in our own personal chaos, the coherence that waits to be revealed in our suffering. Though we begin in pain, the creative process is one of intense life. Sherri shares about creating to express, contain and transform the longing and suffering that threatens to overwhelm and destroy. A person can live on when we choose to embody them in their loving ways. We are not bound by the constraints of time. When we leap over the limits of time and create a living memorial, we touch eternity. …Our choice to integrate our loved one’s kindness and good qualities into our lives allow us to become living memorials. Sherri talks about the importance of remembering as part of returning to health. But the burning bush is a symbol of hope…Even when we fear that our personal loss may destroy us, the burning bush tells us that we will not only endure but will discover an impassioned and urgent mission; a sense of destiny. Sherri talks about how sometimes that which is most feared, most difficult, can be the place from where we build and repair. As one who loves language, especially Hebrew, I truly appreciate how Sherri weaves into her narrative Hebrew words, their roots and meanings enhancing our understanding of what she is teaching us. Drawing from the richness of Scripture, Sherri also shares from a font of other Rabbinic as well as Christian sources and ends each chapter with questions to ponder. An empathetic and compassionate read – truly a gift of tikkun olam. This is deep, inspiring and true. This spoke to my own heart. I love that we will met who we have not become!